If you could see into the future, you'd proactively plan your BI projects to accommodate all your business' needs. There's no crystal ball, but BARC's BI Trends Monitor 2019 is the next closest thing. It reveals the top 20 trends real businesses are focusing on this coming year (number five was a surprise) so you can be proactive in your BI projects and meet the business' needs before they ask. BARC conducted a survey of over 2600 businesses and vendors from a wide range of industries, countries, professional backgrounds, and business types and sizes so you would get the most comprehensive picture of BI's future. 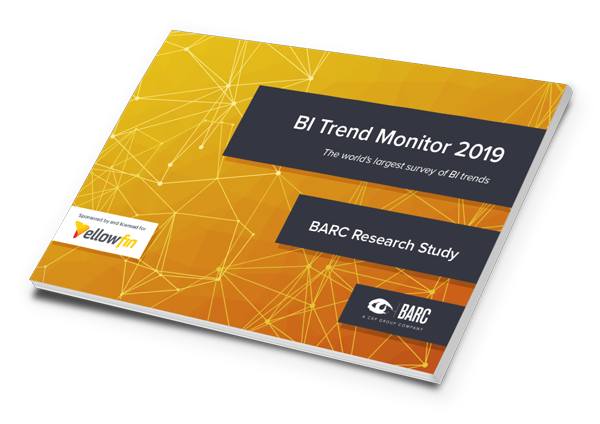 Download your free copy of the BI Trends Monitor 2019 today.